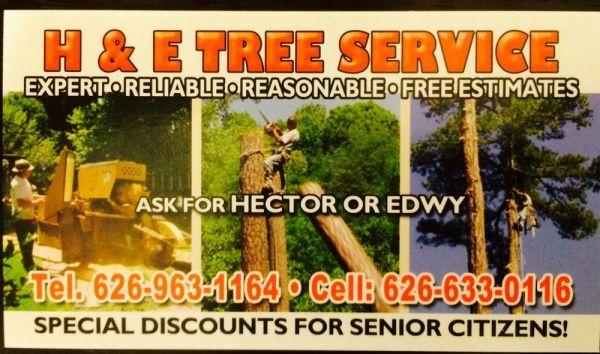 H&E Tree Services - We are the best tree service in Azusa, CA and the entire San Gabriel Valley. We are the best tree service in Azusa, CA and the entire San Gabriel Valley. H&E Tree Services is a fully insured, completely bonded, CSLB state licensed professional tree care company. We provide annual, seasonal, monthly, weekly and emergency tree services for residential and commercial customers in and around the San Gabriel Valley, Inland Empire, and North Orange County. We are expert tree service providers, and happy to offer the best rates ever. Look below to see a list of what we offer. Headquartered in Valley Center, CA, North County Tree is a professional tree service company. Locally owned and operated with over 25 years of experience in tree care and hazardous tree management. Call the real professionals at A & J Tree Service, to set up a hassle free, no obligation appointment at your convenience to give you a good price.